Starting on 10 September, the War Games in the Stronghold mode will be held weekly on Sundays [Updated]. All clans that participate in Stronghold mode automatically become participants of the War Games leaderboard. The best clans on the leaderboard will earn Tier XI and XII reserves, and players who participated in battles will be rewarded with gold. 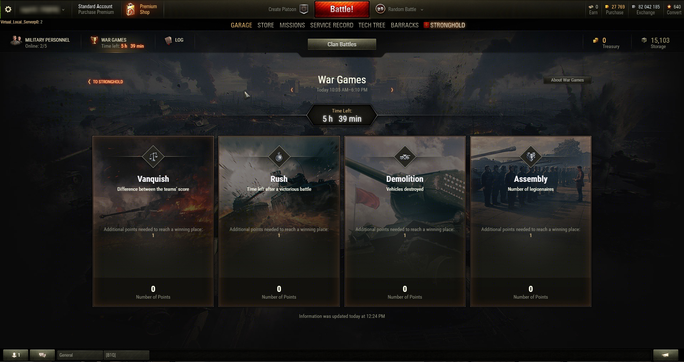 The prize pool of the War Games will be 167,000 and 193 reserves. Demolition: points are received for each enemy vehicle destroyed. Vanquish: points are received for difference in the number of destroyed enemy vehicles between the teams. The bigger the difference, the more points the winning clan receives. Rush: points are received for quick victories. The faster the clan wins, the more points it receives. Assembly: points are received for the number of legionnaires in won battles. The clan receives points for each legionnaire in victorious battles. Thus, a clan will receive points in four leaderboards at the same time for each victory in the Stronghold mode. The number of points will depend on the battle mode. 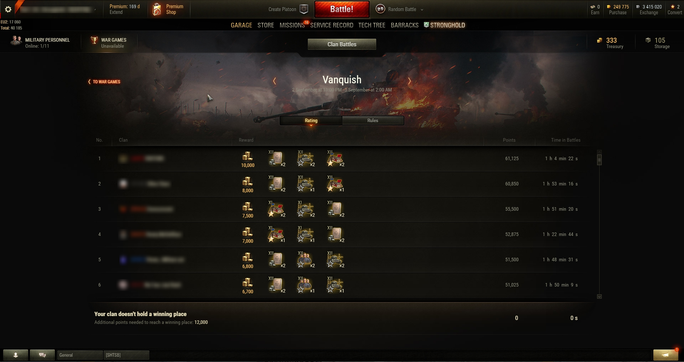 In Advance of Tier X, the coefficient will be higher than in Skirmishes. See more details in the corresponding section of the Guide. The War Games leaderboards are built three times per day; once the competition is over, the winners of each leaderboard receive the reward. The leaderboards are independent. If the same clan takes the top position in different categories, it will receive rewards for each of them. There are individual prize pools for each stage within a day. The rewards include: clan reserves of Tiers XI and XII, as well as gold. The prize pool and the number of prize-winning places of particular completions are displayed in the Stronghold interface. The clan reserves are added to the winner clan. Gold is distributed among the players who participated in the Stronghold mode depending on personal contribution of each player. If legionnaires played for the winner clan, they also receive gold similarly to the clan members.